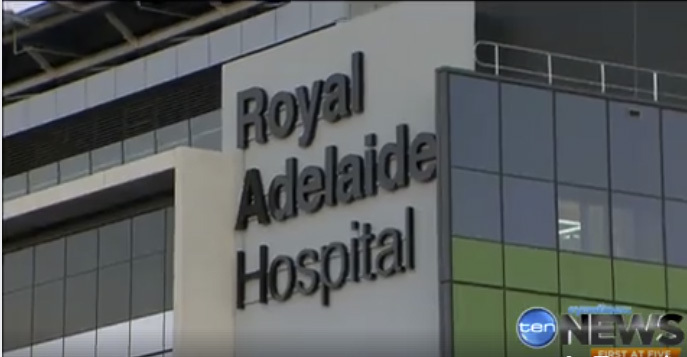 Royal Adelaide Hospital, dubbed the “third most expensive building in the world” is doing more to help with global climate control than any other first world hospital. But a few weeks ago some of the planet saving batteries leaked all over the floor. The government has claimed it [Royal Adelaide Hospital] produces half the greenhouse gas emissions of other hospitals. Shame about 80 litres of sulphuric acid spilled into a hospital room. Firefighters were called in, and one person had to be decontaminated. Are battery acid burns covered on your health plan? Four giant batteries installed inside the new $2.4 billion Royal Adelaide Hospital to help the facility meet the Weatherill government’s strict low-emission targets have ruptured without warning, spilling 80 litres of sulphuric acid. The toxic accident in a power generator room inside the hospital, which opened in September after delays and legal disputes over building defects, saw one person exposed and decontaminated at the scene by firefighters. Central Adelaide Health Network chief executive Jenny Richter said replacement batteries had been ordered but would not be installed until the cause of the initial rupture was determined and all issues had been resolved. The affected batteries are separate to the hospital’s back-up power system, which includes six diesel generators. The acid spill comes weeks after it was revealed the hospital had to employ people to hold some doors open for orderlies because of a design defect. An investigation into the incident has yet to determine what caused the batteries to rupture. However, an SA Health spokeswoman yesterday confirmed the batteries had been replaced with a newer model and that “tests … have declared the system safe to resume normal operations”. Back up generators failed at two South Australian Hospitals during the power blackout in 2016. In 2016, Queen Elizabeth Hospital lost air conditioning on a 34C day. Late last year, the same thing happened at Royal Adelaide Hospital (RAH). The new big expensive showcase RAH only opened last September. So since then, I expect the State Government has been more careful about testing those back up generators. But even testing them has a price. Yesterday, in routine maintenance, Royal Adelaide Hospital had an unexpected 20 minute blackout. Patients and doctors were left in “limbo” during operations. People could have died (but didn’t). Not surprisingly other people waiting for surgery felt even more anxious than people waiting for surgery usually do. Patients were put at risk during a 20-minute power outage at the new Royal Adelaide Hospital, that left doctors scrambling in the dark while conducting surgeries, with local Australian Medical Association president William Tam describing the “difficult, ­harrowing moment” as “unacceptable”. One section of the $2.4 billion hospital, which opened in September, went black just before 11am when software controlling the source of electricity failed to switch from a generator back to the mains following regular maintenance. Wait for it: one generator ran out of fuel, and software bugs meant software didn’t switch back to mains power as it should have. “We advised that following regular maintenance of a generator, the software that controls which electricity source is used did not transfer power from the generator back to mains power, leading to an outage,” he said. Presumably, this could happen at any hospital as they all need back up generators. The real problem might be that Governments run by gullible people who are bad with numbers and believe that hospitals should control the climate, will test any system til it fails. Deputy Opposition Leader Vickie Chapman said at the time that “it would be great if the state government ­focused on helping sick people at our hospitals instead of focusing on their pet issues like carbon emissions”. The batteries were separate to the hospital’s back-up power system, which includes six diesel generators. Will be having batteries at traffic lights in south australia next…wonder how that will work out? If/when there are any problems, they’ll blame it on too many CO2 spewing cars. Autonomous vehicles need a fully networked wireless signaling system. All these signals need electricity. This electricity MUST be reliable. It will be fine until the millenials realize they can charge their iphones off the traffic lights……. then it will be like watching a flock of seagulls fighting over a bag of chips as they fight to plug in and recharge…. I remeber some tongue in cheek dig at yuppies back 20 years ago about how they all travelled in rnage rovers in vonvoy in case one of the billy joel tapes broke…..now it seems people can go anywhere while thier precious smart devices are low on juice….kind of pathetic really….. The saddest thing is that it appears Weatherdill will be re-elected, mainly because the is no viable opposition, no one with enough balls to question or challenge his twisted green idiotology! I have no idea who is the opposition leader = shows how much of a traction he has! Despite all the bluster from Xenophon, he backs climate change and is not real clear how he will fix the energy balance despite wanting stable base load power. OH and should you feel sorry for the SA sheeple? No you get what you vote for OR yes there is no viable alternative OR you ALL cast invalid votes in protest!! -If it’s like South Africa, first, the batteries will be stolen and after that, the solar panels. One junction installation had to build a blockhouse, reminiscent of the WW2 Atlantic Wall, to protect the batteries and electronics. I read some of this in the Australian today. They reported the fuel problems and some supposed software issues. a few weeks ago some of the planet saving batteries leaked all over the floor. What batteries? If they need Sulphuric Acid then Lead Acid batteries I assume. Why did they not install a room full of Tesla Powerwall Lithium batteries? The post says ONE generator ran out of fuel. WTF. I suppose that they all ran out of fuel! Otherwise No Problem. If an aircraft with 4 engines looses power the problem is usually either the fuel supply of the pilot. Likely both at fault in this case. I do not know how that could be. Architecture? Possibly because they didn’t want the hospital to burn down. Maybe that is why they did not use the TESLA Powerwall batteries. “…half the greenhouse gas emissions of other hospitals..’? That is because it holds fewer patients than ‘other hospitals’… Sir Humphrey would be proud indeed! Peter, the reason for using lead acid batteries is they can be deep cycled where doing that with Lithium batteries will kill them. The one worrying thing for me is that they say the batteries are inside the hospital. I hope not, because when they are charging they give off hydrogen – a spark and boom. In all the installations of large lead acid batteries for UPS use that I have seen they are in a separate building and the batteries themselves stand in a lead lined coffer dam. I doesn’t sound as if these were which is bad design but then SA doesn’t appear to know much about large power installations. …, the reason for using lead acid batteries is they can be deep cycled where doing that with Lithium batteries will kill them. No. !…the reason for using lead acid batteries is because they are cheap. Many quality modern lithium cells can be 100% discharged, ….some even to zero volts for extended periods…and recharged with no loss of capacity or life. Also the majority of modern lithium cells will have a cycle life expectancy several orders of magnitude greater than even deep cycle lead acid batteries. ……but if you want cheap,…then you chose lead. ! I thought that high-quality submarine batteries were far better for continual deep-cycle discharging and re-charging. Still not sure about Lithium’s ability to withstand this process continually. The best lithium batteries I’ve heard of are used by Tesla cars, and I’m not sure they can survive much deep cycling. Are there better lithium batteries around? There is much debate on this currently.. But generallt Lithiun is better all round, especially for a sub,..BUT.. The question is over the (perceived). safety risk. However the new Japanese Subs will be Lithium powered..
Don’t forget the oxygen from the other electrode. Sorry forgot to preface with the following quote from Peter C.
Why did they not install a room full of Tesla Powerwall Lithium batteries? I should use preview more often. I saw what you wrote but knew what you meant. - and by candle light. they’ll still rake in / taxes when there’s nought / to base them on. The electricity Grid is composed of a lot of separate parts . But the essential parts are reliable electricity generators. That is what we had before (COAL fired generator plants). Now we do not have enough of them. Never fear, this article explains how coal and gas will be dead in a few years. I love the ‘Despatchable Wind and Solar’ line. Have we all been wrong? The ironic thing thing is that this site has a widget showing the source of all power in Australia. Thats the benefit of always talking about a rainbows and unicorns future. You never have to deal with reality or even talk about the means of getting to the proposed nirvana. The Green insanity marches on. On the bright side, nobody died this time and these kinds of things are the only thing that might wake up the populace. If the government doesn’t care about the citizens, you’d think they would at least be worried about the tourists. GIve it time……then watch them scramble to dig holes in the ground to try and escape the blame…like rabbits…..
How could this possibly be the case when this hospital runs on its own 6 diesel generators (that are high CO2 emission) most of the time because renewables are unreliable? What a giant deception! I wonder who members of the ALP SA state government socialise with. There are so many ALP state government employees in SA that they’d never need to meet anyone outside their leftist bubble. It would be fine they would just regurgitate the lines of comrades Weatherdill and Mr K. everything is awesome! look at my selfie with Elon! Clearly, they bought the wrong brand of battery. Right now there’s a Tesla battery floating around in space copping temperatures of 120C, which is more than enough to slow-cook a nice boeuf bourgignon. And not just the battery. The whole car is still showroom, right down to the plastics on the dash and bucket seats. Of course, a slow-cooked crow might be more to the point, the way some state economies are going. But you know what I mean…Buy quality and save, save, save. A hundred degrees celsius or it’s free! You reckon it’s not a cardboard copy? And some people believe space is cold! In practice of course, the vacuum of space retains no temperature it is neither hot nor cold, electromagnetic energy is free to travel through it with nothing to interact with. Within our solar system matter gets hot depending on how much the solar energy can warm it, or cold depending on how fast it radiates thermal energy when not bathed in sunshine. I find it remarkable that our planet is rather good at precisely retaining the solar energy required to maintain life, and radiating back to space all it does not need. The battery, window glass, and drive train were removed before the car was mounted. They did a “shake, rattle and roll” test on the car to make sure it wouldn’t come apart on launch. Well who ever winds up with it has a long way to come for a warranty job…. From what I read about the SA hospital problem, it seems to be a case of inadequately tested software, plus a bad process in place that allowed a maintenance worker to do the wrong thing, or alternatively the worker didn’t follow the correct procedure. What idjit decided it would be a good idea to test this system during a critical time of the day/ week and reminds me of our local hospital during a storm the electricity grid was knocked out by falling trees the backup generators started ok but there’s no maintenance after hours so no one to fill the gennies up . And then after they ran out of diesel the battery back up kicked in for a while till they went flat and then it was exit signs only no emergency power to any critical machine . robert, that is the correct time to test because it is the only way to know what happens under stress conditions. As we know Murphy tends to pop up in such situations, as he did, which makes it imperative that such tests are undertaken. Hopefully they will have learned from this and will do better next time. Actually, Ivan, I don’t agree. You can stress test anything without risking patients in ongoing surgeries. They could have scheduled the test and insured that there would BE no ongoing surgeries during that test. Incidentally, most surgeries are done during the day, the energy load is usually worse during the night, I would think. But this doesn’t really sound like a stress test if they were only testing one generator. The question is, if they have 6 generators and were testing one, when the double failure happened, why didn’t a different generator start up when the power failed? Are they all fed from the same tank? sounds it. My thoughts exactly , most hospitals only do emergency ops on weekends and usually they don’t do anything after 6pm during the week . When I worked in the telecoms business between 1973-1996 all the larger exchanges had a dedicated battery room. Both the floor and lower walls were covered with glazed tiles, and the doorstep was raised above the tile level. The whole idea was that even a total spillage of every battery (and some of these were HUGE – containing many 10′s of gallons of electrolyte) would be contained, without any risk to other parts of the building. These days the vast majority of lead-acid batteries used in UPS / back-up power supplies are of the sealed gel or AGM type, so I am surprised that this leak occurred in the first place. If Tesla batteries sell for $20k we will have a lot of thefts!!! A new crime is born. From a purely technical standpoint there is almost absolute certainty that this sort of “shutdown” or “blackout” is avoidable. If electrical engineers were set to produce a “fail proof” system it could be done: this is 2018. Unfortunately we have Politicians who have become so self confident and self absorbed in their media portrayal of the green saviour that they interfere in areas best left to experts. And the Top Rank Stupid excuse justifying this behaviour is that the batteries are helping to cut down on that dangerous gas Carbon Dioxide. As if to heighten the appearance of stupidity and ignorance the truth of the matter is that CO2 may be seen truly, as the Gas of Life. We all know that oxygen is an essential part of our being, its job is to get into the bloodstream and go to work around the body. CO2 accumulates as a waste product in the bloodstream and the autonomous part of our brain monitors the levels of CO2 there and adjusts breathing patterns accordingly. The brain responds to CO2 levels and should CO2 fall below a specific level, the brain will be unable to detect CO2 and shut down further breathing. CO2 , the gas of life. During prohibition, sulfuric acid… Oops, better digress. In America mystical fanatics cowed the Dry Kleptocracy into making beer a felony, in much the way fanatics cowed the Australian government into forcing you to vote for the Econazi Kleptocracy. Sulfuric acid produces the hydrochloric acid that digests starch into corn sugar. Fleischmann yeast, Budweiser malt extract and corn sugar produced some 95% of all ethanol and income of the yeast and glucose trusts. In much the same way as central breweries and distilleries were banned then and there, men with guns are today attempting to force infidels to close down reliable power plants in the name of superstitious pseudoscience here and now. Ivan, I disagree that you should test the emergency generators at the busiest time of the hospital. Weekly the generators should be run up for 30 mins or so to Make sure they work, reach temperatures pressures eta once per month they should be connected to the hospital supply,0400 sounds a good time with the least number of critical activites taking place. Emergency generators, their operation and mantenance is pretty cut and dried these days, they just need to do it properly. Steve, I agree routine running tests should be carried out at regular intervals to make sure the equipment is actually working – that is a given. The problem with emergency switch over is that it doesn’t usually happen at slack times but at times that are the busiest. It is how the whole system reacts – equipment and people – that you need to know (slack time and full use time have totally different requirements). With an hospital you need to know how people and equipment react when it is an emergency situation. In this case it appears that the people part worked well but the equipment part didnt. The weekly test is done with the generator unloaded, or possibly with a dummy load so you avoid wet-stacking. Full generator pick-up testing is usually once or twice a year and should be coordinated to avoid interrupting surgeries just in case things go pear-shaped. Cements the place of SA citizens as crash test dummies of you think it is OK to risk live patient operations without warning for the sake of a technical test. The clinical staff should ceratinly havetheir own procedures and should be able to test them when it is timely and safe to do so. I suspect if they get it wrong again, the local great whites wont go hungry…..
I’m with Ivan. His response covers the situation for sane places. For SA, which is (let’s hope temporarily) insane, the case is even stronger. Hospitals need to be ready for a power cut at any hour of day or night. If not, they will bear out the warnings of the rush to “renewables” leading to deaths. Perhaps the bigger question is why test at all; will grid unreliability not give them ample pracice? Four giant batteries … spilled 80 litres of sulphuric acid. Giant litres undoubtedly. I like the newsspeak. Bet they don’t make super profits. $2.5 billion for a measly 800-bed facility? That’s some pricey care SA patients are going to be shelling out for a long, long time. The former SA Governor must be very happy that she had them remove her name from this hospital! there have been rumours about troubles and coming troubles circulating for some time. A neighbour who was involved in the commisioning and “planning” sold up last year and took off travelling around Australia. He claimd that there were major faults largely caused by the public servants involved trying to appease politicians and changing things. And in pressuring the builders to complete quickly any changes without planning. His view that not being around when “the sh!t hit the fan” would save him being the target of those responsible for the mess when they came looking for scapegoats. And that was before it was opened. Some idea of the thought that went into the design is the installation of those doors which prevent snow flurries getting in (and are now held open by people standing there). I would suggest that the battery storage indoors was probably another change made without much thought. The fact that they used lead acid batteries when there are so many alternatives is an indication of poor electrical design. Vanadium flow batteries would probably last >30 years and have better charge/discharge characteristics than Lithium ion. The capacity of the battery is determined by the volume of the +ve and -ve ion storage tanks. The whole unit can be built into a 20ft shipping container so can be delivered on site as a separate module, can be replaced easily or added to as the system grows. The Vanadium Flow batteries used on King Island were removed, apparently because they failed to do the job. KISS (Keep It Simple Stupid) applies to all emergency systems. Complex integrated systems require an on-site specialist to cater for critical failures. I imagine that there was an architect involved in the Adelaide Hospital, – a fundamental mistake. I had an architect tell me “I would never work in Melbourne again”, because I exposed his shonky financial games to the customer. Of course he was just an egoistic W***** and it came to nothing, but at least he started paying the bills on time. Almost as good but “legal.” Doesn’t upset the script or Fly. “Bankers” is a word which uses the second letter of the alphabet but, after my experience of working for a large Australian bank nearly twenty years ago, I still have trouble with it because I always think of that word starting with the fourth-to-last letter of the alphabet. It seems most appropriate. Once upon a time, well, not so long ago; just last century in fact, I was employed in the data centre of one of NZ’s banks. The data centre, of course, handled all the daily transactions for the bank’s branches throughout the country. Everything had a duplicate stand-by, except for personnel. The Auckland data centre was backed up a standby data centre in Christchurch. The building had a basement full of electrical equipment. First, there were six inverters, one for each of the three phases plus its stand-by unit. These sat between the three-phase mains and everything else comprising the building’s load which included computers, lights and airconditioning. (No air conditioning = no computers! Big disaster!). The inverters functioned as power conditioning equipment, conditioning the incoming mains power, so noise spikes didn’t pass through into the computer systems (and personnel ). Basically: each inverter controlled one phase. They were interconnected to control amplitude and phase angle with the others. All AC was rectified (turned to DC). The DC was heavily filtered. Some was diverted to trickle charge the lead-acid battery cells, and the diesel-generator’s starter batteries. The rest was “chopped” back into AC (and heavily filtered again) to supply the building. If any inverter failed, its stand-by unit took over and the technical staff went into a controlled panic to bring it back on line (fix, repair or replace as needed). These were the heart of the UPS (Unbroken Power Supply). There were two battery rooms. One room was the main battery room, the other was the back-up battery room. The batteries were open lead-acid battery cells ( 1.2 volts per cell) daisy chained together by the shelf to form an overall 12V battery (actually 14.2 Volts at full charge). The four shelves of a battery “cabinet” were paralleled. The wiring was … umm … substantial. There were about eight sets of shelves in the room although my memory is not clear on this. This was all built in the early 1980s. Each battery cell was a thick (about 20mm) toughened glass battery case, with a lead matrix immersed in sulphuric acid. (I had battery maintenance duty about twice a year, wherein I had to take samples of liquid from each cell, measure and record its Specific Gravity and ensure the acid was at the correct level in the case namely up to level line painted on the case. Everything was recorded. Anything wrong, it was my job to fix. If any battery was bubbling, I had to report it—something was wrong). These cells were open to the atmosphere so a face mask was compulsory safety wear along with a brightly coloured plastic suit and boots. Sulphuric acid just loves cotton, leather and skin. Each of the two generator sets was a three-phase General Electric and a V8 Caterpillar diesels. The diesels were taller than I was and shook the building when running. Ear protection was necessary when they ran. The moment mains power failed, the inverters switched to batteries. The batteries could run the data centre for at least twenty minutes. It took two minutes to get one of the diesels started: glow-plugs had to heat up and then the starter was turned on. The diesel ran for another three to five minutes (can’t remember exact time) before it assumed full load. Any problem here, the stand-by generator was brought up. That is a complex chain with many things which can go wrong. We tested our system once a month, early in the morning (before Start of Business — 9am) by manually turning off the mains power. We would run on diesel for an hour and revert to mains in time for Start of Business. If the SA hospital UPS spread acid all over its floor, the batteries could have boiled. That implies something went very wrong, most likely with the battery bank. One reason for using lead/acid batteries is not so much cost but ruggedness. Lead acid batteries can be bumped up against their maximum charge ceiling by constant trickle charging more reliably than Li-ion batteries, although the most modern Li-ion batteries have improved enormously. Big Li-ion batteries were not available back then and the inverters I had to work with were optimized to handle lead/acid charge curves. Then too, lead acid batteries don’t self combust. …. but i suspect that those companies supplying commercial , high capacity lithium battery systems…Tesla, A123, LG, Panasonic, samsung, Seimens, etc, etc, have proven Battery Management, Systems which are well capable of eliminating all potential risk factors related to charge, discharge, storage, balance, thermal stability , etc etc.. Most cells are subject to various destructive tests with ” pass” criteria being no thermal run away, no flames, an no explosion..
Lead acid cells may not burn, but they do vent explosive gas, and have been known to destroy buildings, submarines, and people.. However, …..There is no such thing as 100% safe energy storage. Find out how many Tesla cars have turned torch. I know of 4 in the last 4 years. I’m sure there are at least twice that number we haven’t heard about. Samsung had to recall some cell phones last year. A new model got a little too hot to handle. Yes, they burst into flames. There is a video on YouTube about the laptop computer which spontaneously combusted. Then there was the Belgium National Grid `stablilisation’ battery, similar to South Australia’s new one, which let all its smoke out. Malaysian Airlines MH370 still hasn’t been found. They know it’s in the Indian Ocean somewhere from the the bits which occasionally wash up. It was supposedly carrying a largish cargo of Li-ion batteries and one of the causes of MH370 going missing was speculation about a possible lithium battery fire in the cargo hold. Now, no lead acid cell has ever spontaneously combusted. Plenty of Li-ion batteries do. To be blunt: Li-ion batteries are dangerous. If I ran an insurance company, I would be charging very high premiums for anything containing a Li-ion battery. Got a lap top computer? Right, your Contents insurance premium just tripled. Get a cell phone? Add more to the contents premium … for each cell phone. Got an electric car? If the car is parked on the street, no problem. If your garage is part of your house, your house premium just quadrupled. Car insurance for an electric car? Four times that of an ICE vehicle. Based on their track record with electricity and this hospital I’m sure they will do a great job with the submarines. Just hope that we don’t have to actually use them. Aviation ground control and navigation equipment systems also have well-designed backup systems, plus a defined process of testing, so it can be done without impacting services. But all the maintenance staff need to have a mindset drilled into them not to do anything stupid that puts people’s lives at risk. It’s a culture training as well as technical training. The Nu RAH is a gift to South Australia. After all it is constantly giving us all new stories for our entertainment. Two I have heard recently. First involves the robots that deliver the meals. Story goes that one decided to drive itself into an open lift shaft. Don’t really care too much about dodgy robot coding but the open lift shaft rumour is just a tad disturbing. Second is the toilets. Apparently the builders came to the conclusion that all toilets are created equal and treated the building as if it was a hotel. Problem is that this is a HOSPITAL and in hospitals you tend to get a lot of people who flush general medical waste down the loo. This tends to end badly which is why hospital loos are designed with more access panels to assist in unblocking the buggers. Yeah… Our RAH keeps pumping out the wacky stories. What really narks me is what Adelaide COULD have had instead. This was the 2010 election issue. Labor had been talking about moving the RAH, mainly on the grounds of being seen to be Doing Something and totally NOT because any mates in the construction industry wanted to fill their order books for the next decade. This idea was reasonable popular until the Liberals came up with a counter idea. They wanted to keep the RAH where it was, do rolling upgrades over the next 10 years at a fraction of the (then) cost of the new RAH and use the land to build a new sporting stadium. Suddenly Labor came out and announced they had cut a deal to move the AFL to Adelaide Oval. ‘OMG! OMG! AFL at Adelaide Oval!!! HASHTAG OMGAFLATADELAIDEOVAL’ and basically it happened. What else happened is Footy Park was effectively burnt to the ground, because there had to be no doubt that Adelaide Oval was THE place to watch sport. Rugby was interested in upgrading some of their grounds, but were legally blocked by the fine print in the AFL deal. No major sporting ground was allowed to be within sight of Adelaide Oval because that was the one true ground. Hindmarsh Stadium is only allowed to continue because it is owned and run by people not ‘technically’ sporting. Oh yes, Hindmarsh. Where the A-League play. That is currently South Australia’s second biggest sporting stadium. Ya SA. So this is the hidden downside of this amazing new hospital. Adelaide is now effectively a sporting backwater with one stadium, and one stadium that is controlled by the AFL at that. So, second A-League team? NRL francise? Super Rugby? Simply put…. NO. There is no serious stadium to host these teams and there is no way the now controlling AFL are going to allow any other sporting codes anywhere near their market share if they can get away with it. So next time someone tells you Adelaide is a city with a grossly overpriced hospital that doesn’t even work properly you can safely correct them – Adelaide is a Sporting Backwater with a grossly overpriced hospital that doesn’t work properly. And all to win an election.